This is a 2.8 mile loop through woods, with two short out-and-back segments to pretty, calm beaches. There's enough elevation change to make it feel like a hike rather than a walk, but it's still easy. This was my son's favorite hike this summer -- he loved sampling huckleberries and swimming in Tomales Bay. This little gem of a state park on the Point Reyes peninsula is a wonderful destination year round, but I love it in autumn. Portions of Johnstone Trail are chronically swampy, and visiting this time of year ensures the driest trail conditions. Try to schedule a visit for spring, but come prepared for mud on Johnstone Trail. Or cool off from the summer heat with an after-hike dip at Heart's Desire Beach. Park for free at the Jepson trailhead: traveling north on Pierce Point Road look for an unsigned small dirt lot on the right just before the signed road to Tomales Bay State Park. Be sure to lock your car. Hike into the park from the signed trailhead, turn right onto Jepson Trail, then follow the designated hike (you'll join in at about the mid-point). 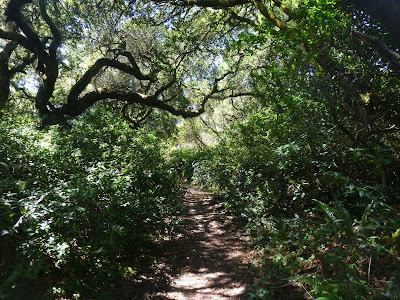 Read about this hike on Bay Area Hiker. Bog Loop, San Bruno Mountain County Park. An under 1 mile loop for absolute beginners or anyone looking for an easy stroll. Blackberries along the trail are ripe and ready to sample this week! Please post your comments and experiences! This Sunday morning I managed to walk a mile and a half without being in too much pain. On the flat. Slowly. Looking forward to being out on real hikes again sometime soon. This one sounds good, haven't ever been here.